Thomas Keller’s Bouchon Bakery cookbook has an amazing, meticulous recipe for croissant dough, which can be used for classic French pastries: traditional croissants, pain au chocolat (chocolate croissants), and pain aux raisins. This is a weekend project, and I literally mean the whole weekend. I complained about the meticulousness of some recipes in this book in a previous post, but I actually really appreciated the level of precision in the recipe for the croissant dough. Everything worked out exactly as described, and it would have been frustrating to put in all that work and have something not turn out correctly. Case in point: rolling out the croissant dough to 19 x 9 inches, so that one could trim the edges for a 17.5 x 8 rectangle that could then be divided into ten equal rectangles for the chocolate croissants. Also, the trimmings made a nice bonus traditional croissant. Thomas Keller recipes often have one or two ingredients that are quite specialized, which makes for quite the scavenger hunt. For the croissant dough, a small amount of diastatic malt powder is added to the dough. Malt powder comes from malted barley and contains the sugar maltose. Diastatic refers to the presence of enzymes such as amylase, which are preserved if the malting process is performed below a certain temperature. The presence of maltose and the enzymes works together with the yeast to make the dough more complex and also contributes to the color. Diastatic malt powder is not available at Safeway, Whole Foods, Draeger’s, Berkeley Bowl, Bi-Rite Grocery, or Rainbow Grocery in the Bay Area. Dry malt extract, found in home-brewing supply stores, I am pretty sure is not correct. I found “malt powder” in a Korean grocery store in Santa Clara, but I have no idea whether it is diastatic or non-diastatic. Regardless, the pastries turned out great using this malt powder. I found Bird’s brand custard powder, used to make pastry cream, at The Milk Pail in Mountain View. 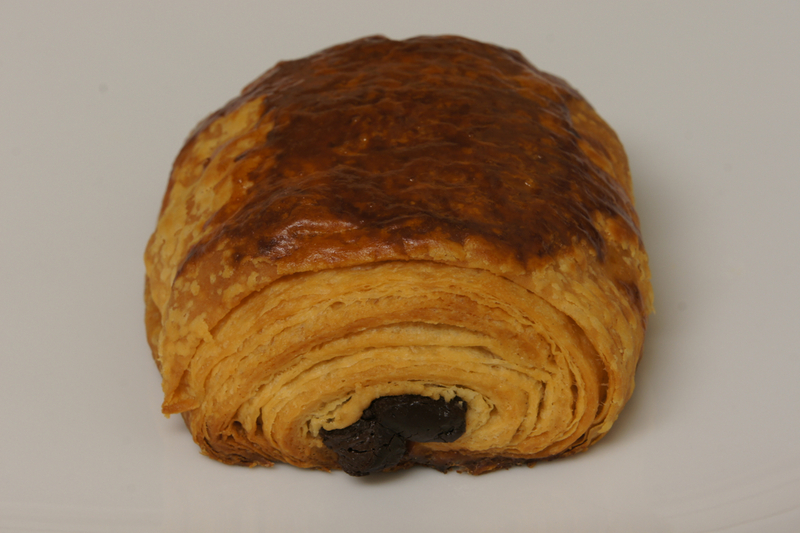 Finally, chocolate batons or chocolate pieces used for the chocolate croissants can be found at Spun Sugar in Berkeley. I think everything could be found on-line, but what’s the fun in that? The croissant dough starts with a poolish, a yeast, water, and flour mixture that ferments overnight and is used as a starter for the croissant dough. The croissant dough contains flour, water, sugar, salt, butter, and the poolish. A stand mixer with a dough hook attachment makes kneading the dough easy. The dough rises for about an hour. Then a 330 gm (11.6 oz) block of European-style butter is enrobed in the dough and then laminated several times (rolled out and folded over itself to create layers). This takes a lot of time and work, because the dough has to be put in the freezer after each fold to keep the butter cold, and the cold dough is a bit difficult to roll. One can then use the dough right away, but I kept mine in the refrigerator overnight. I used half of the dough to make the pain aux raisins, and half to make the pain au chocolat. 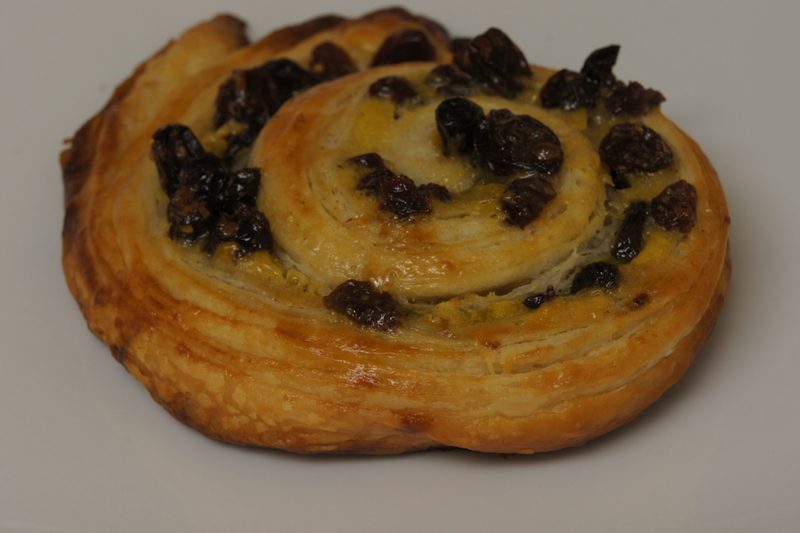 To make the pain aux raisins, there are two sub-recipes, Rum-soaked Raisins and Pastry Cream. Rum-soaked raisins are easy – raisins are soaked overnight in simple syrup and a splash of rum (actually, 30 gm to be more precise). The pastry cream uses egg yolks, vanilla bean, whole milk, and custard powder and requires constant attention over low-heat for the thickening process. The croissants had shatteringly crispy outer flaky layers, and were buttery, rich, and delicious. Pretty much perfect versions of pain au chocolat and pain aux raisins, fresh out of the oven were incredible. I might have liked a little more pastry cream in the pain aux raisins, but this is a minor complaint. Cost: about $20 for 10 chocolate croissants and 10 pain aux raisins. This includes ingredients that were used in limited amounts, like the diastatic malt powder (3 gm or about one teaspoon), custard powder, and chocolate batons. Time: minimum time 22 hours. Mine took about 34 hours from start to finish with active time of about 7-8 hours. Make again: although the pastries were really good, this is probably a one-off due to the amount of time required. Link to Bouchon Bakery cookbook here. This counts as two!!! the treating continues =))! By the way – have you been to Pine State Biscuits in PDX? Love that place! I love that “Thomas Keller” is a level of difficulty in and of itself! It’s so true though. His recipes all work and work beautifully. But you must follow them to the letter, no sloppiness. Congratulations on such beautiful pains au chocolat and pains aux raisins. They look gorgeous! Thanks! Knowing all that goes into making these, it makes me wonder though, how do they scale up and make money? Do they roll out the dough by hand? After all of the labor, these croissants should retail for about $20 each. could you please share the name of the korean grocery store where you bought the malt powder? Thank you, the croissants looked delicious! so sorry, I wrote my email wrong! I think it was the Galleria grocery store in Santa Clara, or possibly Han Kook. If you are familiar with the area, there are several within a few blocks of each other.